The Los Alamos Council on Cancer was founded in 1956. It is organized for the purpose of furthering the education, prevention and treatment of cancer in Northern New Mexico. We are a group of physicians, nurses, medical professionals, survivors and other interested people. Council members do not receive any compensation and give willingly of their time and energy. 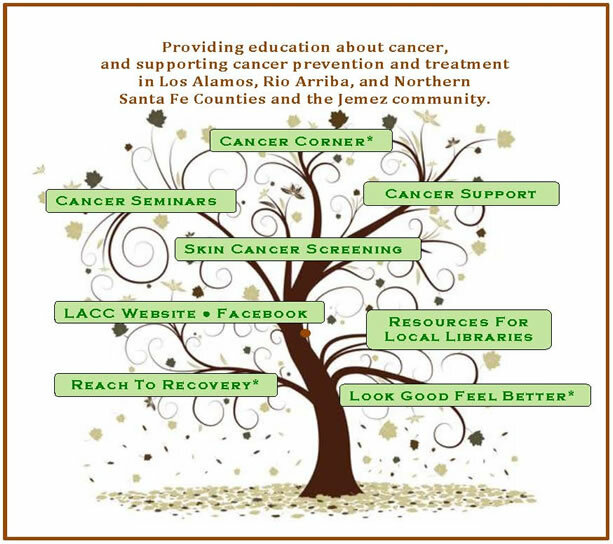 The Los Alamos Council on Cancer strives to increase public awareness of cancer and promotes early diagnosis and treatment. The Council’s Library Gift program provides financial support to fourteen Northern New Mexico public libraries for purchasing, updating and expanding their collection of books and media materials on the diagnosis and treatment of cancer. The Council sponsors seminars featuring local, regional, and national specialists; workshops for medical staff and the public; and participation in the annual Los Alamos Health Fair. The Council sponsors two seminars per year where guest speakers address a timely topic on cancer. The seminars are offered to everyone at no charge and provide continuing education credit to local nurses. The Los Alamos Council on Cancer is a tax-exempt, non-profit corporation, registered with the New Mexico Corporation Commission.